According to Amy Atas, New York veterinarian, the most common assaults to your pet's health when traveling are associated with changes in routine. "Pets are like people," Dr. Atas says. "They get uncomfortable when there is a disruption in the routine," she says. "Changes in food, beds, and climate can give them upset stomachs associated with anxiety." Injuries can range from uncomfortable to life threatening. To be prepared, pet owners should carry an animal first aid kit when traveling. "When putting together a first aid kit," Dr. Atas says, "consider the animal head to toe." The kit must include the following: eye wash (saline solution is fine in a pinch), antibacterial soap, sterile lubricant for the eyes to prevent eye injuries when bathing, Q-tips to keep the ears clean, cotton balls to clean wounds and stop bleeding, hydrogen peroxide, Neosporin, clean gauze to apply pressure to a bleeding area and dress wounds, medical tape, Pepto Bismol for diarrhea and upset stomach, and a copy of recent medical records. If you have to see a new vet when you are traveling you will save valuable time if the doctor can see the pet's medical history immediately. "Injuries are typically sustained when we are not careful and considerate in our planning," Dr. Atas says. "When planning a trip, ask yourself if your animal is the right kind of animal for the location you are going to or if it is the right time of year to travel with the animal." For example, if it is winter in New York and you are traveling to Florida, pet owners may forget that it is flea and tick season there and run into problems if unprepared. "Contact your local veterinarian first and get a checkup," Dr. Atas says. "Then get information regarding your pet in the new location." One more piece of advice before you hit the road. Don't let your dog hang its head out the window. Sand and dust at high speeds can cause serious injuries to the eyes. Keep your pet safe, comfortable and strapped into a seatbelt in a pet carrier that is perfectly designed for automobiles and approved by airlines. Happy travels! 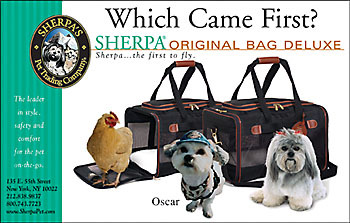 Visit http://www.sherpapet.net for safe and stylish pet carriers that are airline approved.